Leslie Basham: Sarah Walton remembers the difficult early days of raising her son. Leslie: This is Revive Our Hearts with Nancy DeMoss Wolgemuth, author of Choosing Gratitude, for November 20, 2017. Nancy DeMoss Wolgemuth: Well, not long ago, I was handed a manuscript to a book that was going to be released shortly, and I had not finished reading the introduction to the book before I was making a mental list of friends that I knew were going to really want to read this book. And that’s because there are some families, some individuals in my life who have been though a lot of chronic pain issues, Lyme disease, other health issues for these women, their families, children, have experienced. I’ve seen them go through a seemingly endless round of doctors and specialists and consultants and diets. And yet they deal with just debilitating weakness and pain. So this book is titled Hope When It Hurts. The sub-title is Biblical Reflections to Help You Grasp God’s Purpose in Your Suffering. The two women who wrote this book out of their own personal journey with pain, physical pain, and other kinds of suffering, are with me here in the studio today. I’m really thankful for our listeners to hear their story and hear how God’s grace has been so real to them and is real to them in their journey. 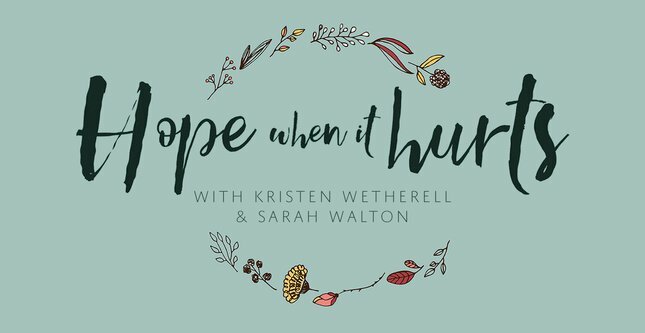 So, Kristen Wetherell and Sarah Walton, co-authors of Hope When It Hurts, thank you for writing this book, thank you for joining us here in the studio today to talk about this journey. Kristen Wetherell and Sarah: Thanks for asking us to be here. Nancy: This is a kind of book, I guess, you hope never to have to write, because you’ve written it out of pain. In fact, I saw a post a friend of mine, and she may be a friend of yours also, Lore Ferguson Wilbert, did about this book. She talks about how you read different books on suffering, but it’s somebody who’s already been through it, and they look back on it and say they have a retrospective view. But she said this book begins not with, “I once suffered and learned how to cope, and here’s how you should,” but, “I am suffering, and here’s what God is teaching me.” That was, to her, what she really loved about this book, that you’re seeing theology unfold in your lives through your own journey. That means that you’ve had to go through some really hard things, and they’re not over, in order to write this book. Sarah: Yes, it’s been a hard journey, that’s for sure. Nancy: I’d love to hear the two of you, because your stories are similar, but they’re a little different. So, Kristen, why don’t you start us out. Just give us a nutshell version of your life experience that led to a book like this getting put on your heart. Well, my story with suffering begins around my junior year in college. I had been studying music theater. So I was very active attending rehearsals, and at that point, I was running races for fun. I started to experience symptoms that were very different—a lot of joint pain and muscular weakness and fatigue, which I tell people was often the worst part because it felt like crawling through waves of dense fog to interact with anyone, and my bedtime was moved up to 8:30. This was over a period of about six years, I would say, and I saw maybe eight different doctors in that time. Nancy: Wow. That’s debilitating in itself just to go through that again and again—go through all those forms, go through all those symptoms. Kristen: Right. And it’s costly. Right? After about six or seven years, by God’s kindness, I connected with a girl who was my age who had been diagnosed with Lyme disease. I listened to her story and her symptoms, and I thought, Man, those are similar to mine. It was a scary thought, but also a freeing thought, which sounds terrible, but, “Could this be the answer?” was my question. The Lord opened the door for us to see a Lyme-literate specialist within two weeks, and they diagnosed me clinically on the spot. Yes, the day the nurse called with confirmation was very bittersweet and terrifying to think, What is the road ahead going to bring? And also, freeing to realize, I have an answer! After all these doctors told me, “No, you’re fine,” I have an answer. Nancy: Even though you have an answer, that’s a long road ahead. Kristen: Right! And how long will it be? Will I be able to heal? Kristen: Exactly. And with Chronic Lyme, which is what they diagnosed me with, that’s when you don’t treat the Lyme disease at first bite. You don’t know how vigorous it’s been within your system, and it could take a long time to treat it, and it has. So we underwent a combination approach to treatment, and God was really kind. We have every reason to believe now after about two years that the bacteria is gone. It’s been eradicated. Kristen: Praise the Lord! But the effects have been astounding, because Lyme really wrecks your nervous system. I’ve had a lot of nerve damage and the fiery, migratory pains in the joints and the muscles and the nerves that come with that. Kristen: It is ongoing. I do think there are ways to lessen it, to strengthen the muscles, to regain that strength, but a lot of days I’m just really weak. So every day is a battle of, “Where am I finding my identity when I’m not able to run anymore or do the errands that I used to be able to do?” Lyme’s effects have been pretty astounding to us and humbling. Nancy: In fact, you and Sarah connected, you were in the same church. Your families were in the same church, but it was a larger church, so you didn’t know each other. But you discovered each other because you had similar stories. Nancy: But, Sarah, your story unfolded a little differently, but some similarities. Sarah: Yes. Mine started, actually, in high school. I went through a period of a few years of a lot of really hard things. I was an athlete, so I had really found my identity kind of in that, not really knowing that. But the Lord allowed some really challenging circumstances. I went through some abuse from some peers. I really caused a lot of struggles with my parents at the time. That kind of ended in me being hospitalized my senior year. I didn’t really want to live anymore. The Lord used that to really shake me out of my stupor, and it was in the hospital that I really committed my life to completely following Christ. I thought that was the end of my hard road, obviously. I went to college, and I met my husband. I got married when I was twenty. Not long after, we had our first child when I was twenty-three. When he was about eight to ten months old, he started showing some signs that things were a little off. It wasn’t enough to make us do anything about it, but he was defiant. He was causing constant trouble for us. He started throwing these tantrums when he got into his toddler years that would be two hours long, banging his head into the wall. It made everything difficult in life, everything—play dates—I had a hard time taking him anywhere. He would break things in the house. He would throw things down the stairs. It just became where he was hard to manage. So as that continued to intensify as he got older, that got more challenging. I think he was about four years old when we started finally realizing, “This is not normal.” He was our first, so we didn’t really know anything else, but it got to where it was consuming our lives completely. We had at that point two other children, and now we’ve had four. So the last, really, ten years has been doctor after doctor after doctor. Sarah: For our son. I wasn’t even really able to deal with my own health issues this whole time because he was so consuming. So that was really our journey for the last ten years. It mostly began with him because it consumed every area of our life. All I was basically doing all day was trying to keep our family safe and him safe. But it did leave us sometimes feeling crazy, like, Is something wrong with us? Are we bad parents? So it was probably two-and-a half years ago thing kind of hit a pinnacle of pain, I’d say. My husband was working on call all the time, and my health symptoms were getting a lot worse at this time. I’d had four children, and that fourth child pretty much debilitated me. I was, the best I could describe it is I felt like I had the flu all the time—that horrible achy, chills. I had pain all over my body. Lots of things that were going on. So my husband took a drastic change, took a job change, lost a lot of our income. We had to move from a house that we absolutely loved, which was very hard. And that, I thought, was kind of a new beginning for us. I thought, Well, we’re closer to family. We’re closer to church. We hadn’t figured out a lot with our son yet, but I was so sick, that was really our next battle—what was going on with me. Nancy: And as you checked that out, things got more complicated. Sarah: Yes. I thought that was kind of the end of the worst of our situation, but still dealing with our son, and that’s really when Kristen and I actually met. She had said at one point, “You should go see my doctors.” And I thought, Well, I know I don’t have Lyme disease. So I finally decided to. At that point, I had no idea who else to go to. I went and saw them, and pretty much the same thing. The first day they saw me, I guess it made me realize I didn’t really know what Lyme disease was. I had a totally different picture in my mind. As they explained really what it is, it was like lightbulbs going off. I was amazed. I was scared. I was excited. It is, like Kristen said, such a mixture of feelings. But that was really the beginning of figuring out what was going on inside of my body, but they believed I’d probably had it since I’d been a kid because I’ve had health issues since then. So, because of that, it’s a long road. It’s not an easy fix by any means. Nancy: And it didn’t just affect you, but it had an effect on your whole family. Sarah: Yes. So that year was really the journey. Once we diagnosed me, we started thinking, Well, could any of this be connected to my son? He has all these neurological challenges. He has a lot of physical issues, too. That was the first time I’d heard that you could pass it on to your kids. I had no idea. We had him tested, and it was clear as day that that was what he had. Not that we know for sure that that’s all connected to his symptoms, but it certainly plays a role. As soon as we realized that was what was going on with him, all of a sudden we couldn’t deny the fact that our daughter, seven years old, was crying of joint pain all the time. Our four or five year old, four at the time, couldn’t make a walk around the block with our family. He was too tired. And our two-year-old was having these night terrors all the time, a lot of similar things as our oldest son. It was just lightbulb after lightbulb, we started realizing the possibility that they all had it was very likely. So that year we went through a lot of testing, had them all tested, my husband as well. And they all ended up being pretty clear that they had it. So it’s been a very up and down—a lot of down—but really just trying to figure out what to do for them. Nancy: And you’re describing a journey similar to some friends that I have. It’s been a lot of unanswered questions, a lot of answers that weren’t satisfying, a lot of trial and error with food and diets and meds and doctors, and a lot of people not understanding what they’re going through. And they don’t understand what they’re going through. As I began to read your book that came out of this journey on getting a biblical perspective on God’s purposes in your suffering, I thought, This is going to be some hope to a lot of people who are hurting. As you tell your story, people’s ears are perking up, and they’re going, “Yes! I’ve got something similar to this,” or “That is my story,” or you have a daughter or a family member or a friend who’s going through some kind of chronic physical or other sort of pain and suffering, and you wish you knew how to help them. And let me say that anybody listening today, my conviction is that you’re either in the middle of a storm, or you’ve just come out of one, or you’re heading into one. Only the Lord knows when. So a resource like this, and what God is teaching you as you walk through this, is such a gift. It’s a gift to the Body of Christ. I know that you wrote it over the last year or so with a lot of weakness and pain, and probably some days when you thought, I just don’t have it physically. I can’t give myself to the hard work of writing. Nancy: But you did it, and you cheered each other on. Tell us just a little bit, Kristen, how the book is formatted so that our listeners will know why this might be meaningful to them. Kristen: Help When It Hurts, we divided into thirty short, accessible chapters. Nancy: Because when you’re feeling crummy, you don’t want to read long chapters. Right? Nancy: And you don’t have to sit down and read the whole thing at once. Kristen: Right. You can jump around if you want. The Table of Contents is really clear. So you can jump around. But we do take you through 2 Corinthians chapters 4 and 5, until about verse 10 in chapter 5. We wanted this to be faithfully biblical. We wanted everything to come from the Word, but also intensely practical, because the Word is practical. It’s relevant all the time. We wanted this to be, not necessarily a Bible study, not a theological tone, because, as you said, Nancy, people who are hurting don’t have time or energy to delve into something like that. So something accessible. Each chapter at the end has about three reflection questions. Kristen: Make it personal, and a prayer, and some Scripture references if you wanted to dig further. Nancy: And a space for journaling. Nancy: Did you all journal through your journey? Have one or both of you? Has that been helpful to you as a part of your journey? Sarah: Yes. I’ve always been a journaler. I would never have called myself a writer, but if I look back at my journals, which, what do you do with a journal? I’ve got a stack of them, and I don’t want to get rid of them because they’re precious. You look back, and you see the growth that comes. But, yes, to me that was the way I could get thoughts that I couldn’t make sense of out of my mind. A lot of times my journals turned into, basically, just prayers. It was prayers that I couldn’t really verbalize out loud. I found I was able to write them. So that’s really why we wanted the journaling pages at the end because, ultimately, we don’t want people to take anything away from us. We want them to get to the end of this chapter and to see, “What is God speaking to me in this?” and to apply it very practically to their own situation, which will be different for everybody. Nancy: And to see how this story is not about Kristen or Sarah or Nancy or the reader. It’s God’s story. Kristen and Sarah: Yes. Right. Nancy: It’s a story He’s writing through your pain, through the storms, through the difficulties, and how His Word informs our response to that story. So journaling in this kind of context can be really, not just chronicling my pain, but it can be a chronicle or record of God’s grace meted out to me in the midst of my pain. I think to be able to go back and look through that, maybe when you’re on the other side of it, or in another chapter of that story, to go back and, really, what you’ve written here is your own journal. Nancy: This is how God has met us in very difficult places. You have a lot of personal illustrations in there, and we’ll talk about some of those over the next couple of days. But this is how God is writing His story in your lives, and it’s not over. Nancy: It’s continuing. In fact, Kristen has found out that you’re now expecting your first child. Nancy: So another chapter begins. Nancy: Here’s what I want to do: You developed this book around one of the most wonderful life-giving passages in all of God’s Word. So I want us to read it together—2 Corinthians, chapter 4—and, shall we begin in verse 1? I think that first verse is so encouraging about not losing heart. Nancy: And then reading through chapter 5, verse 10. It’s about a little more than a half a page in my Bible. And I would just love for us to read this together, maybe each take a few verses, and then pass it on to the next one, and read it thoughtfully because these words have taken such deep root in your own hearts. God’s Word may not heal all our physical diseases, but it is a balm to our soul. It’s a tonic to our spirit. Nancy: So I’ll just start here in verse 1, and then I’ll pass it on to you, Kristen. Lord, this is Your Word. Would You just take it and use it to breathe life and grace into the heart of some listener right now who needs to know that Your Word is more true than even their circumstances, as difficult as they may be, that they’re facing this day. Therefore, having this ministry by the mercy of God, we do not lose heart. But we have renounced disgraceful, underhanded ways. We refuse to practice cunning or to tamper with God's word, but by the open statement of the truth we would commend ourselves to everyone's conscience in the sight of God. And even if our gospel is veiled, it is veiled to those who are perishing. In their case the god of this world has blinded the minds of the unbelievers, to keep them from seeing the light of the gospel of the glory of Christ, who is the image of God. For what we proclaim is not ourselves, but Jesus Christ as Lord, with ourselves as your servants for Jesus' sake. For God, who said, “Let light shine out of darkness,” has shone in our hearts to give the light of the knowledge of the glory of God in the face of Jesus Christ. But we have this treasure in jars of clay, to show that the surpassing power belongs to God and not to us. We are afflicted in every way, but not crushed; perplexed, but not driven to despair; persecuted, but not forsaken; struck down, but not destroyed; always carrying in the body the death of Jesus, so that the life of Jesus may also be manifested in our bodies. For we who live are always being given over to death for Jesus' sake, so that the life of Jesus also may be manifested in our mortal flesh. So death is at work in us, but life in you. Since we have the same spirit of faith according to what has been written, “I believed, and so I spoke,” we also believe, and so we also speak, knowing that he who raised the Lord Jesus will raise us also with Jesus and bring us with you into his presence. For it is all for your sake, so that as grace extends to more and more people it may increase thanksgiving, to the glory of God. So we do not lose heart. Though our outer self is wasting away, our inner self is being renewed day by day. For this light momentary affliction is preparing for us an eternal weight of glory beyond all comparison, as we look not to the things that are seen but to the things that are unseen. For the things that are seen are transient, but the things that are unseen are eternal. For we know that if the tent that is our earthly home [That’s this temporal body right? If that tent] is destroyed, we have a building from God, a house not made with hands, eternal in the heavens. For in this tent [in this body] we groan, longing to put on our heavenly dwelling [our glorified bodies], if indeed by putting it on we may not be found naked. For while we are still in this tent [this body], we groan, being burdened—not that we would be unclothed, but that we would be further clothed, so that what is mortal may be swallowed up by life. He who has prepared us for this very thing is God, who has given us the Spirit as a guarantee. Nancy: Wow, this is the Word of the Lord, and there is so, so much in those verses, and we’re going to take time over the next couple of days to unpack that a little bit through your own lens and your own experience, but let me just close this conversation today by pointing out two phrases that are repeated in that passage. And then he says, in chapter 5 twice, verse 6 and verse 8, “We are always of good courage.” We’re always of good courage. As you’re listening today—I don’t know what you may be facing that is making you want to lose heart. Chances are there’s something in your life, and maybe a lot of things in your life, and you’re saying, “I just don’t know if I can keep going. I’m exhausted. This is chronic pain, chronic problems, chronic issues—maybe with a child, maybe with your health, maybe with something unrelated that we haven’t even talked about—and you’re tempted to lose heart. Let me just say, in this passage, and in all of God’s Word, there is hope for those who hurt. Nancy: Hope to keep you in the race. Hope to keep you from losing heart. Not hope to make all your problems go away, but hope to keep you so that you can keep pressing on. And there is wisdom that can help you to have good courage even when you feel terrified. So we’re going to pick up with this conversation and let Kristen Wetherell and Sarah Walton share with us out of their journey how they have been able to stay in the race to have good courage and not to lose heart. Leslie: Nancy DeMoss Wolgemuth has been talking with Sarah Walton and Kristen Wetherell. If you can relate to the pain and dark seasons they’ve been describing, I hope you’ll get a copy of their book, Hope When It Hurts. We’d like to send you a copy when you support Revive Our Hearts. Visit ReviveOurHearts.com. Why do we have to go through suffering? How does it fit with God’s plan? Kristen and Sarah will be back tomorrow to share a powerful perspective on that question. Please be back for Revive Our Hearts. Revive Our Hearts with Nancy DeMoss Wolgemuth wants to walk with you through life’s tough seasons. It is an outreach of Life Action Ministries.